Here is the list of the hotels near Angivillers. Book your hotel near Angivillers today, Tuesday 14 May for the best price, reservation and cancellation free of charge thanks to our partner Booking.com, leader in on-line hotels reservation. Below here is the list the 50 closest hotels of Angivillers, sortable according your criteria. You will find the position of these accommodations on the Angivillers hotels map. Boasting a garden and a restaurant, Hotel De Dijon is situated in Montdidier. This 2-star hotel features free WiFi and a terrace. Guests can make use of a bar. All rooms in the hotel are fitted with a flat-screen TV. The units feature a wardrobe. A continental breakfast is available daily at Hotel De Dijon. Hiking is among the activities that guests can enjoy near the accommodation. Amiens is 44 km from Hotel De Dijon. The nearest airport is Paris Beauvais-Tille Airport, 46 km from the hotel. This hotel is located near the centre of Compiègne. It offers air-conditioned rooms and free private parking on site. Free Wi-Fi is available throughout the hotel. Rooms at Premiere Classe Compiegne - Jaux are equipped with a TV and private bathroom with shower. Premiere Classe Compiegne – Jaux is a 30-minute drive from Charles de Gaulle Airport and a 30-minute drive from Parc Astérix. HotelF1 Compiègne is located in Venette, 49 km from Roissy-en-France. Free WiFi access is available throughout the property. Every room is equipped with a flat-screen TV. All rooms have a shared bathroom. Guests can purchase microfibre towels at the hotel at an extra cost of EUR 3 each. A free private parking is at guests' disposal. Compiègne is 3.7 km from hotelF1 Compiègne, while Chantilly is 33 km away. The nearest airport is Paris - Charles de Gaulle Airport, 47 km from the property. The hotel is ideally situated 5 minutes from the city center of Compiègne, the Golf and the national forest. The ibis Styles Compiegne offers 58 rooms allying comfort and modernity in a friendly environment. For your relaxation, fitness room and a sauna are available in the hotel. A Cinema, a bowling, a carting track and restaurants are in the vicinities of the hotel. With a garden and a terrace, Clos Florésine B&B is located in Venette and provides free WiFi. A continental breakfast can be enjoyed at the property. Compiègne is 2.7 km from the bed and breakfast, while Chantilly is 45 km away. Paris - Charles de Gaulle Airport is 59 km from the property. Bed and Breakfast Paillart Preferred hotel ! Domaine de Vésigneux is a traditional Picardie farmhouse located 14 km from the A16 motorway and 34 km from the centre of Amiens. It features free WiFi, a pool table and a shared lounge with a fireplace. Each room includes a flat-screen TV, an electric kettle and a private bathroom with bathrobes, a hairdryer and free toiletries. A continental breakfast is served daily, and meal trays are possible on request. Domaine de Vésigneux provides free private parking on site and is a 30-minute drive from both Amiens and Beauvais. You can also visit the medieval castle at Folleville, 3 km away. 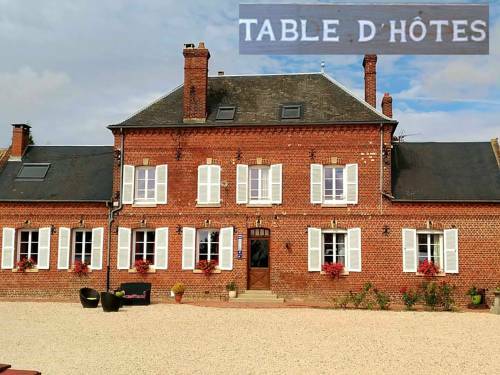 Located in Compiègne, 700 metres from the university and a 10-minute drive from the train station, this 24-hour reception hotel offers a bistro-style restaurant and a bar. Free WiFi access is provided throughout. The rooms at ibis Compiegne have a flat-screen TV. The private bathrooms each feature a bath or shower and a hairdryer. A buffet breakfast composed of sweet and savoury dishes such as eggs, fruit salad, yogurts and juices is served every day. Pastries baked on site and fresh French Madeleine cakes are also on offer, as well as a hot beverage and a piece of fruit to take away. Outside of regular breakfast hours guests can also enjoy a lighter option, available from 04:00. The hotel is located 3 km from the city centre and a 30-minute drive from Charles-de-Gaulle Airport. There is a free, private car park on site which does not require reservation. Kyriad Compiègne is situated a 10-minute drive from Compiègne town centre and a 15-minute drive from the A1 motorway. It offers air-conditioned rooms with flat-screen TV and Wi-Fi access. You will be greeted with a courtesy tray with hot drinks and biscuits. Each room also has a private bathroom with a bath or shower. A buffet breakfast is served daily. Breakfast is also available in the room on request. You will find a choice of restaurants in Compiègne town centre. Situated in Sourdon, Le Clos St Vincent provides accommodation with a terrace and free WiFi. This holiday home features a garden. The holiday home is fitted with 2 bedrooms, a TV and a fully equipped kitchen that provides guests with a dishwasher, an oven, a washing machine and a microwave. The holiday home offers a barbecue. Amiens is 31 km from Le Clos St Vincent. The nearest airport is Paris Beauvais-Tille Airport, 34 km from the accommodation. This Mercure hotel is located on the outskirts of Compiegne 5 km from the town centre. It offers air-conditioned accommodation, a restaurant and free on-site parking. Free Wi-Fi is available. Rooms at Mercure Compiègne Sud are equipped with satellite TV, a telephone and private bathroom. Mercure Compiègne Sud’s restaurant serves traditional French cuisine that guests can enjoy on the terrace during nice weather. Mercure Compiègne Sud is a 1-hour drive from Paris and a 40-minute drive from Charles de Gaulle Airport. The hotel is accessible from the A1 motorway. The Hostellerie du Royal Lieu is located 2 minutes from Compiègne town centre, on the edge of the Laigue Domanial Forest. It offers 3-star accommodation with free Wi-Fi access. Rooms and suites at the Royal Lieu are individually-decorated and feature a flat-screen TV with satellite channels and a private bathroom. Guests can enjoy a daily breakfast buffet and the Royal Lieu’s restaurant serves regional cuisine. There is also a bar and a garden terrace. The Royal Lieu Hostellerie provides a 24-hour reception. Free private parking is also available on site. Located 10 minutes from the city centre and the train station, 45 minutes from Roissy Airport, 30 minutes from the Asterix theme park and 15 minutes from the armistice plain, Hotel Compiegne offers rooms with free Wi-Fi access. All rooms feature cable TV, tea and coffee making facilities. They are complete with an en suite bathroom. The hotel's restaurant offers an à la carte menu and buffet serving starters, cheese and dessert pastries. Free private parking is available at the hotel. Located on the Oise River, in Compiègne city centre, this hotel features free WiFi, en suite rooms with an LCD TV and secure parking at an extra cost. The buffet breakfast is offered every morning in the dining room. Each soundproofed room at the Hôtel de Flandres includes a telephone, a wardrobe and a desk. They offer a view of the river or the city and room service is provided upon request. Shops and restaurants can be found in the hotel’s immediate surroundings. The Musée Antoine Vivenel and the Tourist Office are 400 metres away, and Campiègne Castle is a 10-minute walk away. Free buses are available around the city and garages for motocycle or cycles are available on site. Below here is the hotels map of Angivillers. Names and details of Angivillers hotels can be shown on the map clicking on the prices icons.